Christina Reads Your Recommendations is a regular Monday feature here (inspired by A Reader of Fictions' Sadie Hawkins Sunday) in which you, my readers, get to choose what book I will read and review next. Got a book that you love and want everyone to read and review? That you're not sure what to think of and want a second opinion on? That you think I'll love or that I should have already read? Send in your recommendations via this form! May contain spoilers for Under the Never Sky! Threatened by false friends and powerful temptations, Aria and Perry wonder, Can their love survive through the ever night? In this second book in her spellbinding Under the Never Sky trilogy, Veronica Rossi combines fantasy and sci-fi elements to create a captivating adventure-and a love story as perilous as it is unforgettable. 1. (+) Aria, a protagonist - The thing that I like most about Aria is that she could be any one of us. It's not that she doesn't have a personality--no, far from that. She's strong, sarcastic, determined, smart, but above all, she is still a teen trying to deal with grief and make her way in the world. Some characters come off as too loud, too intense, but Aria comes off as just right and perfectly believable. She also shows more confidence in her abilities as a fighter, singer, and survivor than she did in the first book, though she is not free of other doubts about herself and her status in Perry's life. 2. (+) Perry, a protagonist - What's not to like about Perry? He had to do something terrible towards the end of Under the Never Sky that I immediately sympathize with and he snaps at people and gets tempted to do things because of the stress he's put under and yet... Perry is Perry. As determined, loyal, smart, capable, strong as Aria when it comes to leading and making the right choices. I think what I like most about Perry is how well he matches with Aria and how well their POVs work together for the story. 3. (+) World-building -I'd read some reviews that suggested that there wasn't enough to explain the Aether in Under the Never Sky -- not so here. You learn more about it and experience its brutality. You learn more about the history of the world and how people had separated into such disparate cultural groups. You learn more about various powers, people, tribes, and the dire situation that's pushing this world to the brink of destruction. There's also a lot of sensory and survivalist detail about certain geographical locations and the way some tribes live and die out on their own. 4. (+) Romance - There aren't too many romantic scenes in this book, but there's a reason why Aria and Perry are together on the last cover, and that's because this book does not fall prey to the Second Book Syndrome where couples suddenly seem to forget how much they love each other or all the forces in the world conspire to keep them apart, etc. etc.. There's a lot that Perry and Aria have to deal with in this book, but by far the best aspect is that they retain faith in each other. (Well, besides the slow burn, supportive nature of their relationship). That's not something you see a lot in YA. 5. (+) Plot - This is what I wanted from Under the Never Sky. The predecessor focused on the trip Aria and Perry make and how their love blossomed. This novel focuses on another trip, but the plot threads get twisted so that the romance is not at the forefront; it fades to the back, providing character motivation and tension to complicate the situation. Everything gets complicated. There were twists I could predict and some that I could not. More importantly there was enough tension and conflict to give forward momentum and drive me towards the conclusion with bated breath. 6. (+) No Recap & the Ending - I'd not reread Under the Never Sky before reading this one, so I was a tad confused because I didn't remember some of the characters, but it was better this way. The confusion didn't last for long, and the story got started from page 1. Both books also ended perfectly, setting up the main conflict for the next books in a reasonable way, not leaving it to the last page. 7. (+) Character Cast - I was surprised by how much larger the character cast got in this sequel, but what I think is even more impressive is that I came to care for a good deal of the side characters like Reef and Cinder (Roar was up there from the first book). The three I listed, among others, probably get developed the most, but there was in general a nice mix of characters we got to know better and characters who you sense clearly have a back story? 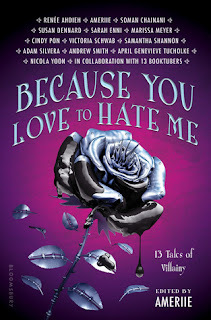 Also, did you know that there's a novella soon to be released about Brooke? 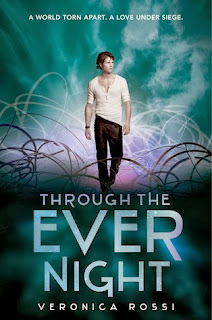 I admit that of all the Through the Ever Night characters, I probably would not have expected a novella focused on her, but I'm intrigued. I may take a look at Roar and Liv soon. 8. (+) Writing - It's not sparse prose per say, but it's beautiful in its simplicity, in the way it evokes your first experiences of the ocean or of an Aether strike, or what it's like to scent others' tempers or experience a virtual reality world. You know how in a dual POV book you might grow to like one POV more than the other? Also not the case here. 9. (+) Pacing - There was not one moment where I felt bored or restless because there was always something happening. The pacing did not relent for one moment, always building towards the climax. 10. (+/-) The Cover - I get that it's probably very hard to make the Outside or the Pods appear realistic on a cover... but I am a bit miffed as to why Perry's wearing those clothes. Don't they seem not only too modern but also not appropriate for someone from the Tides? They could control the clothes, right? I love the colors and how the covers go together but hmmmmm. I'd read a bunch of reviews around the release date that suggested this title was better than its predecessor. It was. Much better. Any issue I'd had with the first novel was rapidly erased in this one. Packed with action, unforgettable characters, and stunning consequences, Through the Ever Night is a gem among sequels. As always, feel free to send in more recommendations! I really love this series. I'm glad that you like it too. Aria/Perry make me so happy. I have the ARC to ITSB and can't wait to read it and finish the series...but I don't think I'm ready yet. I can't believe that I haven't read this sequel yet. I preordered it back in January, so it's been on my shelf for awhile. Under the Never Sky was one of my favorite books I read last year, even though it took me two attempts to really get into it. I'm trying to decide whether I should just wait until January and read both this book and Into the Still Blue back to back. What would you recommend doing? Lol :). Siiri, I will probably never, ever be able to imagine you as a cowgirl - no offense :P.
" Now that they have one, great! Let's move on and give them something to do and I'm so everglad that this actually happens." Everglad? Is Brodi Ashton rubbing off on you? Your love for Jack and Nikki :D :D? hehe but yes, I liked that their chemistry was even still developed here, though the plot moved forward more than in the previous novel. "Perhaps I should read UtNS before I go into this?" I would suggest at least a refresher. Maybe the Recaptains have a recap of this one? "I remember a lot from that book and perhaps even more than I remember from some of the books that I gave 4-5 stars to since it's so different, unique and memorable and the character names don't even sink into the bottomless sea of character names." <-- Very true. I remember not loving the book - liking, definitely - when I'd first reviewed it, and yet I refer to it a lot and have seen a lot of things that remind me of it too. "They're equal just as Aria and Perry are. They complete each other, but they don't need the other to survive and that's the most beautiful thing about them or about any couple for that matter." Yes.yes.yes. SIIRI lol, ditch the paper bowl if you're that excited about this one :D :D. Just choose this slip! Thanks for visiting, Anya :). You're definitely right about us scientists sticking together! WOOOT. I want to see your thoughts on it! I wonder if this book will fall prey to your bad luck with sequels? Lolololo why do men on covers make you want to vomit everywhere? True. If it weren't for the hype the first book had gotten across the blogosphere, I'm not sure that I would've picked it up at first glance either. Me too, Pam! Especially since this book didn't have a recap - I imagine the same will happen for the last book. I hope we both enjoy Into the Still Blue :). Have you read the novella, Roar and Liv, and do you plan on reading the Brooke novella? Oooh, an ARC for ITSB :). Yeah, I know what you mean. Especially if you're a huge fan of Aria/Perry... though if you have an ARC, then you can reread again if you're missing them :D.
ME TOO. Lol this was a pre-order too, and if it weren't for Sam, I wouldn't have gotten around to it before the last book. I actually would suggest waiting until January. One, the book will make you want to have the last one at hand to find out what'll happen next, and waiting might dim your excitement. Two, I imagine ITSB won't have a recap of what happened before (since this book didn't), so it might be nice to go into the last book with a fresh memory in relation to the characters and what happened. A Brooke novella? I did not know this! I agree - it's not what I would have expected either, but I'm curious about it, nonetheless. And yeah, I totally agree about Perry's clothes on the cover. It was the first thing I noticed when seeing it revealed for the first time. I'm so glad this didn't disappoint you! I like how you've described Aria. She is the sort of character that is almost effortless to connect with. And the relationship between her and Perry is one of my favourites in YA. I completely appreciated the fact that they retained their faith in each other too. A gem among sequels is the perfect way to describe this book. I'm a little nervous about the final installment now (my expectations are HIGH), but I'm hoping it will be just as strong. Brilliant review, Christina! GUH. Where to start. Confession: I won this book right around its release and I STILL haven't read it. *hangs head* I even re-read UTNS in preparation. So naturally I am happily envious (yes I realize that's an oxymoron) of anyone who is able to read it because I WANT TO NOWWW. I love what you said about Aria. She's so distinctive, but yet she still has that awesome "everyman" feel and her personality is one that a lot of people will see something of themselves in. Plus I just adore her. I'm happy to hear that she's just as stand-out in this one, and that the side characters are developed. That makes me happy happy happy! A Brooke novella? I didn't know! I still haven't read Roar & Liv. I fail. Well, I don't know, Christina. That guy . . . mm, just too hot. XD But I do get where you're coming from. Something a little bit more tribal and less modern would be better. And Brooke . . . who's she again? I forgot who she is. Damn. *shoves that aside* So forget all that, and let's go angsty and complain about how 2014 is so far away! Damn, 2014 is so far away. It seems a common marketing thing now with the big series that they'll release another novella - or one novella between each book, at least. Like Warner/Adam for Shatter Me. Now Roar/Liv/Brooke for this series. Hee, I actually didn't identify with her as much in the first book - mostly in the beginning - but I do think it's effortless to identify with her here ;). Also YES, more relationships like Aria/Perry would be much appreciated. AAAAAAHHHHH Molli, you should reread Through the Ever Night soon, especially if you've read Under the Never Sky. Weren't Aria/Perry on your list of most liked slow-burn couples? You must see how that's developed here too! I haven't read Roar & Liv either. Honestly, it'll take a bit for me to get around to any extra novella, even if I like the books & world they're based in. And it seems like a lot of people didn't know about the Brooke novella o.O. Lol, the guy is definitely hot. Sort of reminds me of the covers for Jennifer Rush's series. And the Fallen by Thomas... S.? series. Hahaha, Brooke is Perry's ex-girlfriend. I'm still unsure what her novella would have since she has such few scenes in the sequel to begin with, but hey maybe that's what'll make it interesting? Actually you know, it doesn't feel like 2014 is so far away. It seems like just yesterday, it was summertime and time needs to stop moving so far away... you can angst :P and I'll bite my nails and panic. I have not read it either! Ha, I was hoping you had so that you could answer that question for me ;). But it's Roar, so how bad could it be? Thanks, Jasprit! It's probably one of my favorite things when a sequel or any book really develops those secondary characters. I hope we'll both like Into the Still Blue and that it outdoes even this book ;).